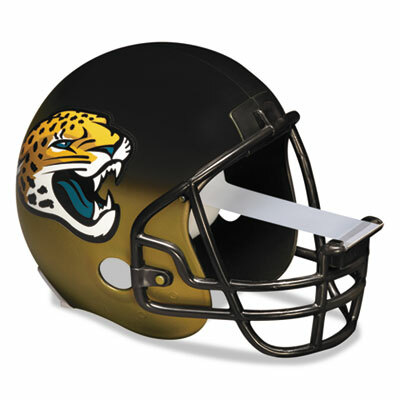 NFL Helmet Tape Dispenser, Jacksonville Jaguars, Plus 1 Roll Tape 3/4" x 350"
Scotch® NFL Helmet Tape Dispenser, Jacksonville Jaguars, Plus 1 Roll Tape 3/4" x 350"
Tackle your projects with a Scotch Magic Tape helmet dispenser. Includes one roll of Scotch Magic tape. Make every play count and keep your favorite Scotch brand tape at your fingertips - at work, at school or at home. Tackle your projects with a Scotch Magic Tape helmet dispenser. Includes one roll of Scotch Magic tape. Make every play count and keep your favorite Scotch brand tape at your fingertips - at work, at school or at home. Color(s): Black Core Size: 1"
For Tape Length: 350" For Tape Width: 1/2" to 3/4"